The Marshmallow War in Ocean Beach last night, July 4th, was less than a third of what it was in 2013. Way less marshmallows were thrown, the throwing did not get out of hand, and by 9:50 it was over and there was hardly a marshmallow in the streets down around Newport and Abbott. It indeed, was but a shadow of its former self – and that was a good thing. No violence. No riot. Compared to last year, there were no marshmallows thrown before the fireworks, none thrown during the fireworks, and after the explosions and light show, it took a few moments before the first white globs were seen in the air. 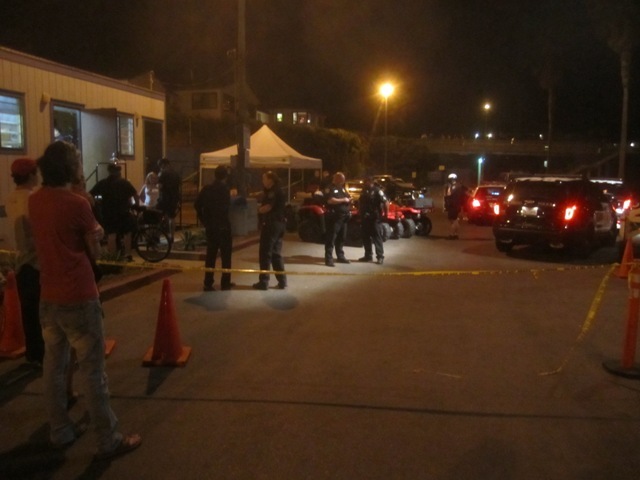 Police were fairly low-key, although their presence was known – they had set up a command post in and around the trailer in the OB Pier parking lot. At least two arrests were made – one was related to the marshmallow throwing. The OB Rag had several observers present at last night’s revelry – including this reporter – in order to monitor what exactly happened when the fireworks ended – to see if the marshmallow ban held or not. For most of the time, I stood close to the intersection of Newport Avenue and Abbott Street with camera and notebook in hand (most of my photos didn’t come out for the bad lighting). Matt Wood was close by as were a couple of other observers. One – Daniel H – sent us multiple tweets of his observations which Patty back at the office re-tweeted last night. I took my position before the fireworks went off. The crowd had gathered – yet two hand-made signs strapped to flag poles and illuminated with their own lights announced “No Marshmallows” and “Littering is illegal”. Half of the last block of Newport had been blocked off by police as well as the south end of Abbott. Once in a while a chant of “U-S-A! U-S-A!” would break out briefly. An Uncle Sam on stilts strolled by. People were streaming in from all over. Over to the side, right near the OB Hotel, a 3-member band from Alpine called “Hello From Montawk” was trying to play. Another reporter, J.C. Playford, came up to me and told me the OB Marshmallow Wars were famous all over the world, in Europe and England. At this point, the beach was packed. The cement sidewalks were packed. The grassy areas were packed. 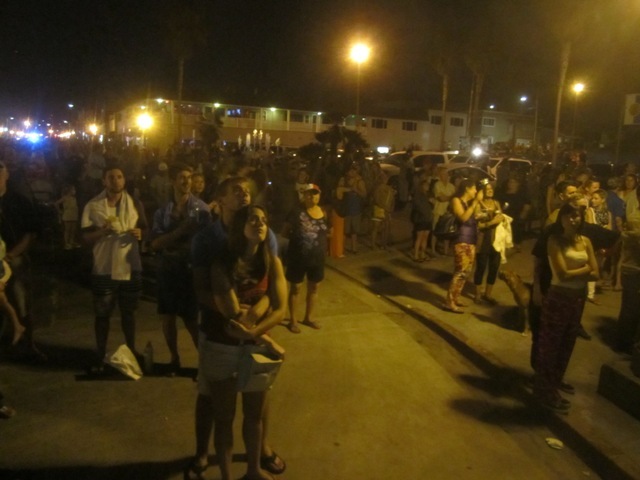 A small crowd stood in the street on Newport watching the lights and sounds. 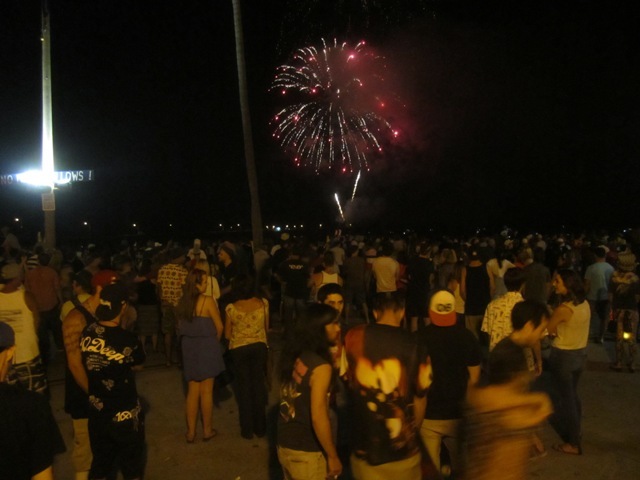 But this is not a report on the fireworks – they were great as usual …. A couple with a dog stood next to me. She used to live in OB but now they live in Ramona. They couldn’t wait for the marshmallow shindig to begin. I asked her about the marshmallows. She said “It’s a tradition. Like turkey on Thanksgiving.” They both later threw a couple of the blobs taken from the street. Ironically, the couple was staying in the OB Hotel. Minutes later, I watched as the hotel manager, Steve Grosch went by with a bag busily picking up marshmallows. Sure, marshmallows were thrown, but not too many reached the street. Other observers said that the beach was filled with them. But a person who showed up to clean this morning – Sat. the 5th – said there weren’t any in the streets – unlike last year. 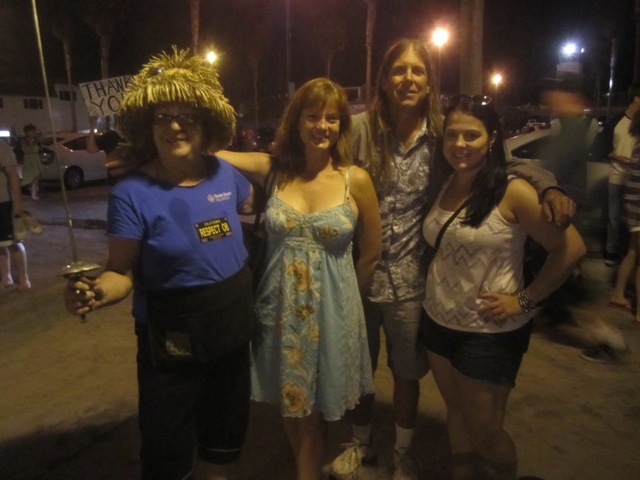 All our observers concurred – much more tame than 2013. Grosch was part of a team of OBceans going after the white stuff that included Pat James of the OB Historical Society, Gretchen and Trudy from the OB Town Council. To a person, they all said that it was much more mellow than before, like maybe only 20% of last year’s over-the -top event. Trudy of OBTC, Mel of Woman’s Club, Pat of OB Historical Society, and Stephanie. One arrest was made of a woman when she jumped on a teen male after he had thrown a marshmallow at her. She had grabbed him in a headlock and was punching him. She was taken away to applause from the nearby crowd. Near the end of the evening event, as crowds were leaving the beach in troves, a woman started throwing sand on homeless people and calling them names. Another woman jumped up and confronted her. The first woman began attacking her, pulling some of her hair out. A third woman joined the fray as did another, both trying to pull the assailant off the person who had tried to stop her from dissing the homeless. All 4 were taken to the police command post to get the stories straightened out. The police released the woman who confronted the assailant – and I spoke to her. Kayla Ziogas had stood up for the homeless, and no, she’s not homeless. She’s been in OB for 2 years and a had a group of friends who all hugged her and her friend Erin who had come to her rescue. 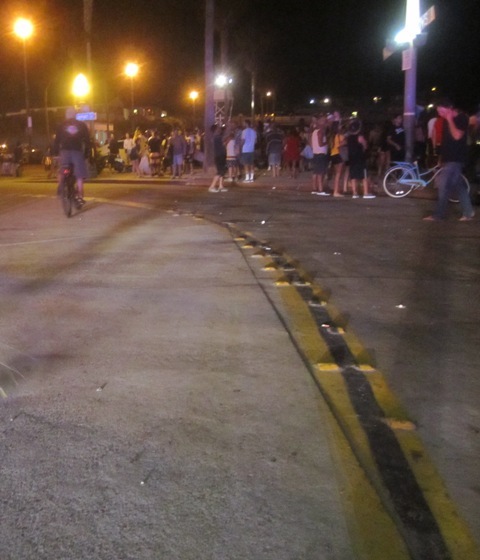 As I said earlier, the marshmallows were over by 9:50pm and the beach and street were clearing out. The Town Council’s attempt to ban the tradition that had gotten out of hand was 80% successful – if you want to put a number on it. The marshmallow controversy is over – for the time being – the clean-up that followed was much more “mallow” than past years. On to the rest of the summer – and on to the rest of OB’s controversies. ….. It still happened. And in addition there were fights and arrests. There was less mess in the streets, but that’s because there were people picking up the marshmallows before anyone could step on them. Aging Hippie – We have to call you on your pledge to offer a public apology or at least an acknowledgement that there was no riot or violence as you predicted. So please – step forward and do it. Why? I was right. The marshmallow fight did not end, and there were fights and arrests. I will admit that my predictions may have been hyperbolic, but they were still correct. You did not, and cannot, end the marshmallow fight, and you did add negative consequences. 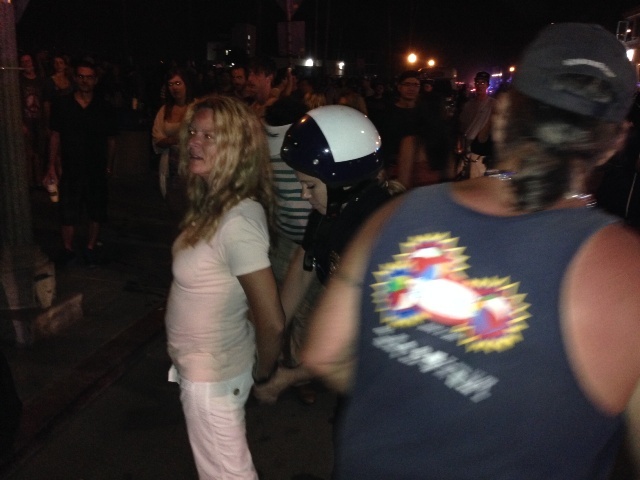 C’mon Aggie Hippie – be a hippie – I agree with most of your comments, but you did tell everyone that if there was no riot on July 4th you would make at least a public acknowledgement that you were wrong. Shall I copy in your quote? Be a good sport – maintain your credibility here. Ok, I see that you did already (see comment below). Thank you. Now where is your apology for changing the editorial stance of the OB Rag for no other reason than that I agreed with it in principle? The OB Rag never changed our position. We were first critical a year ago of the OBTC resolution because it was not based on community consensus and because it appeared that they were going to pressure the police to stop the throwing. That turned out not to be the case. Fear of any violence or riot totally dissipated. We like just about everyone else were tired of what happened last year and something needed to change. Even thought they didn’t have jurisdiction, except a moral one, the OB Town Council stepped up and took some responsibility – as no other group would. And it worked. The craziness that had spoiled a tradition was gone last night, much of it confined to the sand. It did not dissipate, you unilaterally declared it dissipated. And although there was not a full scale riot, there also was not a stop to the marshmallow fight. And you did change your position, your first article said this is not the right way to approach this, then in a later article you flip flopped to “we support this”. And it did not “work”. The stated goal “RIP OB Marshmallow Wars 1985-2013” DID NOT HAPPEN. There was still a marshmallow war in 2014. I guess it’s some consolation that I’ve turned out to be the bigger man in this, willing to apologize where I was wrong when others will not. We’ve said it multiple times. NO ONE thought it would end 100% in one year. No, you did not. You and the OBTC PUBLICLY CLAIMED that it would not happen. “RIP OB Marshmallow Wars 1985-2013”. You were wrong. Waiting for your apology. Not reposting mine a third time. I’m not getting drawn into this. You are twisting the words of a slogan. Not one of us ever said it would end 100%. NOT ONE. Please keep grasping at straws like a petulant 6 year old. Totally unable to admit you were wrong, while accusing me after I did. Who is the petulant 6 year old in this situation? You did half-apologize if you want to call it that. Well done. I have nothing to apologize for. If anything I apologize to everyone else having to listen to me getting worked up over your insane thoughts and behavior regarding this campaign. I don’t disagree with everything you post but your manner of conveying it often makes me want to pull my hair out. You do have something to apologize for. You stood with everyone else in claiming that the OBTC would totally stop the marshmallow fight using police and volunteer sunderkommandos, and that there would be no negative consequences whatsoever. That didn’t happen. And now I call on you to admit that you changed the editorial stance of the OB Rag on this issue, whether because of simple hypocrisy or yielding to pressure from members of the OBTC or Mike James. We always yield to pressure from Mike James, cuz he buys us good beer. That’s right Frank, if you want to see me buy you a beer at Pizza Port again you’ll do what I say. We’d yield to the OBTC if they simply upgraded the beer they provide before each meeting. Next year I want to see the beach areas have a contest. PB, MB, OB, IB. Whoever has the least amount of trash picked up wins! What should they win?? Oh man the riots the humanity!!!!!!!! Is ob still burning? There are always fights, and always arrests on the 4th of July. I think the marshmallow fight went off very well last night. While I think a complete ban is ridiculous, as it takes away such a bizarre event that a lot of people young and old enjoy, it definitely needed to be reduced in size. Marshmallows still flew, but for the most part it was kept mostly on the beach. Before the fireworks, I saw some teenage kids ripping down the “Mallow Out” signs, but besides that, it seemed to be all under control. Personally, I’m glad the mallows were still flying and I’m also glad that it didn’t completely flood over into the streets. I think both sides won last night! It was improved by confining it to the beach. Also, volunteers were picking up marshmallows before anyone could step on them. As I said, it was not possible to just end the marshmallow wars. And as I said, adding police pressure increased the violence and other negative consequences. I admit that my predictions were hyperbolic. But the main points were still correct. I publicly apologize for any exaggeration, but not for the central claim, which was correct. I’ll now wait for Frank’s apology for compromising his journalistic ethics, and the OBTC apology for the arrogant claim “RIP OB Marshmallow War 1985-2013”. I think the “Marshallow Wars” turned into a “Marshmallow Fight.” Much better! As I said previously, the statements were hyperbolic. I publicly apologize for exaggerating, but not for my central premise, which was and is correct: the OBTC could not ban the marshmallow war, and adding police made the situation worse, not better. Same dude doesn’t think drugs get dealt on the seawall or under the pier. Lets not forget….. July 16, 1995. Danny Lee White shot David Wilkins in the back of head at the sea wall at Del Monte street, left him for dead, took his cash & he died the next day. We have murders at the beach too. Very sad . Look it up. We see a lot of drug things every day if we just look out the windows or car doors. People need to grow up & get over marshmallows. behavior. OB could be even greater without the thugs of which there are too many in OB. OB doesn’t have to be the armpit of all the beaches. People need to get more involved & stop letting the goons attempt to take over. Police can’t do it all. Get real & grow up. Less mess, more aggression. Before the start of throwing of marshmallows a drunken 40+ yr old child decided he should use intimidation and threats to discourage marshmallow throwing. Picking a person at random he came up screaming about the harm of marshmallows and to get to get out of HIS town. People stepped in, including his mother, before he started throwing punches and was taken home while screaming about going back to prison. Stay Classy. News says there were “several” arrests, not two. Wonder if that was Tyler. I understand that the Town Council felt that they had to be very aggressive to accomplish their task…whether or not I agreed with the task is not the point. What they failed to do was encourage both sides to calm down and use logic. The aggression mentioned above could have been prevented if the Town Council was more focused on making a positive difference and less focused on “winning”. Heather – Actually, our campaign did focus on getting people to calm down and use logic. Our campaign was called “Mallow Out” and we actively encouraged people to mellow out, and “make s’mores, not wars.” Additionally, we had a ‘Peace Patrol’ of community volunteers that went person-to-person along the beach before the fireworks to peacefully and calmly ask people to mallow out and trade their marshmallows for prizes. We actively took steps to avoid aggressive, intimidating behavior, instead getting the message out in a positive and calm manner. I’m open to what other suggestions you have, but one drunk guy does not equate to a failure. Who is this guy called “Aging Hippie” ? His strategy of ‘fanning the flames’ on these pages failed miserably…. time to put down the glass pipe ol’ fella! Who is this guy called “obecean”? His strategy of falsely accusing others and implying they’re drug addicts is failing miserably…time to put down the oxycodone ol’ fella! It’s a wonder the Aging Hippy could officially be any more irrelevant than he already was. Congrats on setting the bar lower than anyone ever thought possible. Still, you’ve managed to go even lower. MrVloggerfrog, needs to get camera that has auto focus , and stop moving so much. It gave me a headache???? Great coverage, Frank. With this I think you’ve established the OBRag as the premier online local news and information source for the community. Stop…..Stirring the pot & poisoning the waters. Your posts read as if you need to either grow up, get a job or get a new life. So sorry you feel the need to perpetuate Drama. Go out. & walk, join the Y, ride a bike. Get off the internet! So a positive suggestion is “stirring the pot” and “poisoning the waters”? You really love cliches, don’t you, even when they’re not appropriate. I would point out that you also are on the internet, rather than walking or bike riding, and that your post contains drama, while the one you were responding to did not. You seem to be forgetting that the chili cookoff funds the fireworks and its the fireworks that draw the people to the marshmallow fight. I know all this seems funny to you but I can assure you there was nothing amusing about the gooey mess up and down the streets in years past. Another problem not discussed is how many marine fowl became sickened or even died as a result of eating that junk. It’s not good for their system but they pick it up in droves. As for Kraft I’m pretty sure once they saw the mess left and the bitter controversy they wouldn’t be proud to have a role in it other than unintentional. If there’s any reason to agree with your position it’s the troubling nature of restricting peoples’ activities because it’s too much work to clean up, or too hard to control, and our lives would be so much easier if we didn’t have to deal with all the damn people that come here. This is the attitude that spawned Prop. D and IMO that has done great harm to our local economy in ways people just can’t comprehend. When you see a pothole in the street or a streetlight that’s burned out, or class sizes increasing in schools, well thank Prop. D. That includes those of you with children who voted for it. If we want to chase people away and turn OB into a ghost town well we can do that but since tourism is San Diego’s biggest industry I hope you like a bowl of dirt for lunch. And the chili cookoff couldn’t generate that money if it were held during the winter when people actually eat chili? I have not seen anything, not even skunks, eat marshmallows. Ants are the only animals that will touch them. In addition, if they haven’t been stepped on they’re quite easy to dispose of – as demonstrated at this year’s marshmallow war (which supposedly wasn’t going to happen). You miss the point. Sponsoring and organizing the event would change its nature. The fight would become a minor sideshow in an event featuring marshmallow-themed food, marshmallow-themed crafts, and marshmallow-themed games that would actually generate revenue. Is prop D a sales tax increase? I’ve never heard of it. But I think the solution to the pothole/streetlight issue is to base vehicle registration cost on weight, not value, and the solution to increasing class sizes is to halt vouchers and equalize the per student expenditure in all districts statewide. Odd that you bitterly oppose the marshmallow fight, yet in the next breath you fear the loss of tourism. I watched Fort Lauderdale kill its tourism by imposing order through force; same thing can easily happen here. Nice try, Aging Dippy. Suddenly, your dire predictions of police smashing people in the face with billy clubs and OB being set on fire are hyperbole. Nope, you were just totally wrong. Any value from your ideas or opinions no longer holds water as everyone on here can see your true colors. You’re nothing but a contrarian who can’t even admit when you’re absolutely wrong. Kudos to Frank and the OBTC for doing a great job discouraging the marshmallow war. Proud to have such good leadership in the OB. Now on to keeping the OB Precise Plan in force.